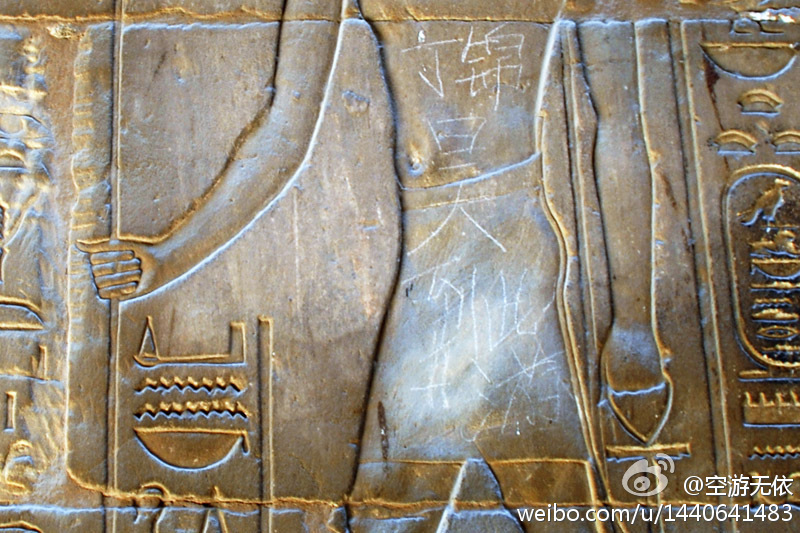 The “Ding Jinhao Was Here” on the Egyptian Temple, Shameful! After netizen @空游无依 saw words like this on a relief carving at Egypt’s Luxor Temple, he said this was his saddest moment in Egypt. Ashamed and unable to show his own face. “We tried to use tissues to wipe off this shame, but it was very difficult to wipe off, nor could water be used, as this is a 3500-year-old historical relic.” Don’t forget, when you go abroad, you represent China! Evening Paper report. “The saddest moment in Egypt, so ashamed I couldn’t bear to show my face.” This microblog post from netizen “空游无依” quickly stirred up heated discussion. He saw someone carve “Ding Jinhao was here” in Chinese characters on the relief carving of the Luxor Temple in Egypt, and felt shocked and ashamed for how carelessly a fellow countryman vandalized a historical relic thousands of years old. Many netizens uniformly expressed indignation at this, crying out “Ding Jinhao, you’re about to become famous!” Experienced tour guide Mr. Zhang, who has led tours in Egypt multiple times, said damaging and smuggling relics across the border already violates local laws, and one could go to jail if it is caught considered serious. Netizen “VicHo”, who has traveled to Egypt before, sighed and said, “Was that freshly carved/scratched on? Last year when I went to the Luxor Temple, I didn’t see it, or perhaps it’s because it wasn’t on the main paths… The temple reliefs in Egypt are nearly all this exposed, and after seeing so many, one almost can’t help wanting to reach out and touch… Sometimes, I feel bad for these ancient relics, but at the same time what can you do…” Today, famous microblogger “蜡笔小球” made information about the identity of “Ding Jinhao” that he had searched for through his microblog, claiming that he [Ding] was a middle school student from Nanjing. Many netizens said bluntly that if this is true, they hope the kid and the parents will apologize for this. “In the past, there were fewer Chinese tourists to Egypt, and their characters were relatively higher, and I’ve never seen a tourist behave this way. There are very rarely tourist police near the Luxor Temple, probably because they never thought something like this would happen,” experienced tour guide Mr. Zhang said. The “was here” behavior is a bad habit of some of our country’s tourists, and they probably didn’t consider that doing something like this is seriously damaging historical relics. In the future, write in Japanese. Doesn’t matter what language is used, you’re a shame to all humanity either way. Don’t just blindly feel ashamed. What was carved was Chinese characters, but it may not necessarily have been carved by a Chinese person! There’s a box of Chunghwa cigarettes on the ground, but it may not necessarily have been littered there by a person of China! You really know how to find excuses, don’t you! No wonder China is like this. precisely because there are too many unbelievable people like you, who always blame the problems on others/think it is other people’s problems. People who don’t admit their wrongs are even more shameful. My god, talk about having no character/decency. He must have finally got the chance to travel somewhere and thus wrote this, definitely a diaosi. There is no definite correlation between character and wealth. Diaosi do not necessarily all lack good behaviors and upbringing. Gao fu shuai too are not necessarily all people of elegant and noble behavior. I’m speechless. Just because a fellow national carved a word on other people’s stones, you guys want to drive this fellow compatriot out of the country? Is face more important, or is our unity more important? You are an 2B. Evaluation complete. Our Chinese nationals love doing things like this. Look at the pavilions in parks, the larger bamboo stalks, trees, rocks. As long as it is somewhere that can be written on, what place isn’t a mess of graffiti, even the toilets? That’s why now it has to begin from ourselves, stop doing these kind of unethical, uncivilized, harmful things! What an international embarrassment. As a Chinese, I feel extremely mortified at this moment.